On the XM RadioBaseball This Morning: Playoff Edition today, a caller from Delaware chimed in to share his joy for the Fightins. He may have just created the next great new catch phrase, saying, "Boston did it. The White Sox did it. Why can't us? Why can't us." 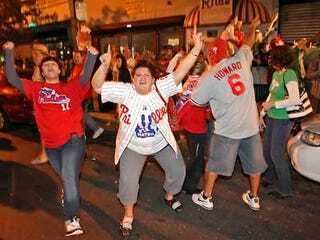 2008 Philadelphia Phillies: WHY CAN'T US!